Dan Torop, Seizure, 2009, color photograph, 12 3/4 x 18 1/2". If we are in fact “jetting through the world with our tails on fire,” as Ishmael Reed’s 1977 poem “Sky Diving” suggests, how might we approach photography, a medium that can uncannily seize a passing moment and give it a new life as an image? In a manner that is as erudite as it is modest, Dan Torop eloquently responds to this question with his current exhibition, “Skydiving.” Reframing the prephotographic depiction of nature––in particular Nicolas Poussin’s arcadian sensibility and the tradition it fostered––through the democratic camera of postwar photography, Torop’s fifteen photographs present a vision scaled not for the cloying grandeur of gods, government, or international capital but for the poetic limitations of human life. Torop sharply pursues this elusive subject, accepting that its capture as an aesthetic object is uncertain even with photography’s technological refinement of Western painting’s visual techniques. A motley flock of sheep populating a hillside, a heron floating squarely above a forest stream, a dog walking into a forested sunset, a hiker passing through a valley of green hills, and a tortilla roasting by a campfire are just a few of the images offered in Torop’s fourth solo exhibition for this gallery. Yet within all the work appears an intimate awareness of photography’s discretionary frame and its relationship to the subjects it commits to image, with Torop acutely negotiating this relation to construct photographs that privilege viewing as an emotionally nuanced form of self-awareness. This is why the most powerful image in the show is Seizure, 2009. This piece cleverly and affectively illustrates photography’s cathectic cache without proscribing access to its sentimental munitions––those punctums lying unknowably in wait. 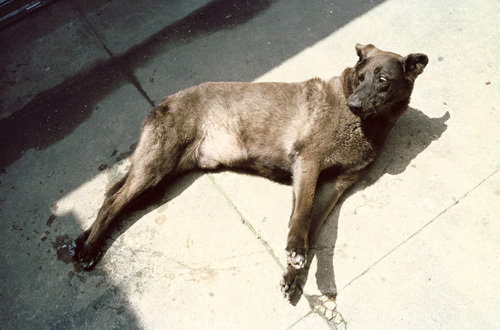 Seizure self-reflexively captures a dog’s seizure; its bulging eyes gaze across its body as if pained to register the moment’s jolting reality through the act of seeing. Even though depicted crippled to the ground, this poor creature appears, thanks to an acknowledged use of photography’s uncanny effects, as if in the free-fall of the show’s title, aware of a present that has been, and beholden to the uncertainty of becoming’s soon-to-be.